When I told people last year that I would be studying abroad in Scotland, most were very excited for me and I am very thankful for the support and encouragement that I have continually received. The next logical question I would be asked was generally where in Scotland I would be? I imagine most people were expecting to hear something like Edinburgh, Glasgow, or St. Andrews. I would reply that I would be in Airdrie, Scotland but was generally at a loss of how to really explain the program well in a few minutes. You mean you aren’t studying at an actual University? There is only one other student in the program? You’ll be studying primarily Bible courses even though you’re an Ed major? How does that work? These were all questions that people were at least driving at if not asked directly as I got ready to go. And it does all sounds a bit strange, doesn’t it? Semester in Scotland is not your usual study abroad program. But I have found it is the unusual things that make this program so wonderful. The program goes beyond unique –it is a rare gem because of its very essence as a special opportunity to learn about the most important thing – God and how he impacts everything in our lives. So what exactly is the Semester in Scotland Program? For starters, it is an academic study abroad program focusing primarily on Biblical studies and history. But in saying this I do not refer to the majors. The program is relevant to any discipline because of the program’s focus on godliness which is relevant to any Christian and is applicable to any area of life. Because it is a unique program it is still hard for me to explain it in a sentence or two. Instead, here is a mini tour of the program. Each week starts out with worship at the Airdrie Reformed Presbyterian Church where the program is based. Each Lord’s Day starts with Church School classes followed by a prayer meeting where the whole congregation comes together to pray. It is such a blessing to hear the Word of God preached in both morning and evening services. We have also been very blessed because each week we are able to go to someone’s home for lunch and this way we have been able to fellowship with different members of the Church. Nicki and I also attend METs (or Mutual Encouragement Times), which are like small group Bible studies during the week. We have been involved in the Kids Club and Covenanter Youth, which run on a Friday night. I am so thankful for the privilege of being involved in the church life here. I have seen so much of Christ shining through the love that the church members show for Christ, for one another, and for strangers like us. Next are our classes. The classes we are taking are as follows: Church Ministry, Women’s Ministry to Women, Systematic Theology, Scottish Church History, The Life and Work of Paul, and Humanities in England and Scotland. It is an incredible privilege to study the things of God’s Word and have time to concentrate on doing so. Each of the classes is rich in content but also eminently practical. Our professors are also fantastic. The only thing which seems to me a tragedy is that there are not lecture halls packed full to hear what we are being taught because the classes are that good! I could say so much more about each of these classes but here is a brief overview. The other main component of the program is the historical and cultural tours that we are able to take each Wednesday afternoon. These tours are led by Jimmy and Helen Fisher, who primarily give Reformation Tours. The tours have been incredible ways to explore Scotland and an excellent springboard from which to go on adventures of our own. But what I love is that Jimmy and Helen take us to the places we would never find on a general tour of Scotland. How many people are able to go to a farmhouse in the middle of nowhere, knock on the door, and be allowed to enter a room full of family history with the library of great Christians from the 17th century at your fingertips? 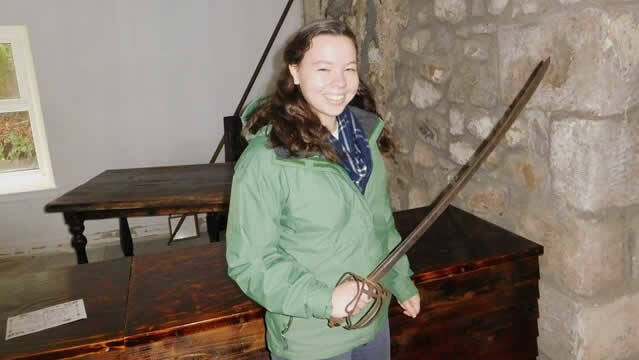 How often do you get to hold a sword from the 1680s? That’s not your normal museum sort of experience. But it has been the content and importance of the places we have seen which is so distinctive. Few people know or care about the rich Christian History in Scotland. Go to Greyfriars Kirkyard in Edinburgh and you can easily sign up for a Harry Potter Ghost tour, but where else do you find a tour guide like Jimmy, who not only is well informed about the places, but also explains the significance of those who died and were buried there. Many Covenanters were buried in the grave of criminals simply for loving Christ and standing up against anyone who would try to rob Him of his place and honor. With our one week Scottish Reformation Tour we have been able to see places where God has worked mightily in the past and where our teachers and guides speak about it unashamedly. We have seen places and learned about people who truly shaped Scotland and impacted the world, but who are sadly passed over by general tourism and even the greater populace of Scotland itself. I do not know of any other program where you can find such a tour coupled with great classes. I have been so blessed with the opportunity to see amazing things. But it is much more than travel. It is the ability to grow in the faith and knowledge of Jesus Christ together with academics, church life, rich relationships, travel and so much more. Even this long description seems inadequate to fully express how amazing the Semester in Scotland program is. Hopefully it will at least give a big picture. Today Rachel and I had the privilege of taking a break from our studies and went to visit Sunrise Christian School. Stephen McCollum, who teaches one of our night classes, is the one full time teacher. Sunrise Christian School is currently the only Christian school in Glasgow, and only one of a few in all of Scotland. Stephen has a challenging job, having to teach a wide range of ages, beginning with P1 (kindergarten in America) up through P5 and beyond (all within one classroom, God bless him). Interacting with the kids and learning some of what goes into planning out a school day was very rewarding. Education in my opinion is of the utmost importance, and this school presented a very different model than I have ever seen before. There was an absence of stress that allowed the students to really seem to enjoy learning. Beginning by singing a psalm and praying, it was evident from the beginning that the school is committed to providing a Biblically based education, teaching the students how faith plays a role in every subject area. Today has challenged me to consider how we can make education better for students. How can we (as older adults, educators, or whatever position you hold in life) foster excitement to learn, to be creative, rather than just create anxiety over getting good grades? Children are such wonderful gifts and teachers have an amazing opportunity to shape the rest of their lives. Even if you aren’t a school teacher, how can you positively shape a child’s life this week? This past week in our Christian Ministry class, the concept of practice in the Christian life really hit home to me. We are studying Donald Whitney’s book, the Spiritual Disciplines for the Christian Life, and this need for practicing each of the disciplines and all as a whole comes up time and over time. I think we often assume that knowing God and having a close relationship with Him will come easily (at least we wish or act like it will). When it does not, we blame it on God not realizing that He has given us the way to gain the blessing. But God gives us good things most often by means of being habitually in his Word and prayer. Because we are unwilling to practice spiritual discipline, unwilling to practice godliness, we end up missing out on the riches and freedom which come from living in the Word. But further to clarify, what I have greatly appreciated about the book is how Whitney stresses the point that Christian disciplines are not a way to earn favor in God’s sight rather they are the means by which we reach the true goal of becoming more conformed to Christ. Reading God’s Word, meditating, and praying do not give us grace, rather they are the conduit pipes that Christ has chosen by which he fills us with Himself and makes us more like Him. That being said, Christ desires and often commands us to practice and work at the means he has given us. I think it is a safe generalization to say that Christians want to be Christlike at least in getting the benefits of salvation, but we do not want to take the trouble of practicing. We essentially expect something without using the tools we have been given to get there. The irony is we think that we are fine neglecting God’s Word and prayer, but we still expect that we are going to grow anyway. In any other discipline practice is an obvious and essential component. Even the most gifted musicians will spend hours daily practicing their instrument to perfect it. The hard part comes not with the idea of practicing, but actually doing it – applying it personally. But another problem for me is that I like things to come immediately, without looking foolish or messing up. But I have realized I cannot expect to get something perfectly the first time without practicing it. It is also not a performance. This past week’s reading was a chapter about prayer. Prayer has to be learned, and it is learned by meditating on God’s word and by practicing it. We do not have to perform for God or for other people, rather we are supposed to pour out our hearts to Him, and we will only grow better at it if we do it over and over again. Chances are it will look like a baby’s first steps, feeble and wobbly, but a milestone at the same time. The amazing thing is that God is pleased when His children come to Him as those who in and through God’s grace are taking baby steps in conformity to Christ. The book has really been challenging me and convicting me of the need for practice, to habitually work at the spiritual disciplines by His grace. I am learning the goal is not covering up my own inadequacies but rather turning to Him when I see those inadequacies and seek more grace. This past week has been incredible. Rachel and I went on a Reformation tour with Jimmy and Helen Fisher. We learned all about the Scottish Covenanters. For those of you who are asking ‘Who were they?’ they were people in Scotland who signed the National Covenant in 1638. And if you are wondering what is so significant about this, it is the fact that this Covenant opposed the belief in the Divine Right of the Monarch. In simple terms, the Covenanters believed Christ was the head of the church, not the Stuart kings. It is largely through the steadfast faith of the Covenanters that Christianity prevailed in Scotland. What amazed me the most this week as we traveled all over Scotland (we put 1300 miles on the rental car) was the Covenanters’ faith in the midst of devastating persecution. Jimmy told us story after story about Covenanters being thrown out of their homes, hung, tortured, simply for going to hear a minister preach. One of the stories that hit me the hardest was that of the Two Margarets. Margaret MacLauchlan was somewhere between 60 and 80 years old, and Margaret Wilson was most likely 18 years old when they were executed together for not swearing oaths to the King, and for attending prayer meetings and listening to preaching by Presbyterian ministers. Accused of these things, the Two Margarets were executed by being tied to stakes in the estuary of the river that flows out at Wigtown. When the tide came in, the women drowned in front of a large crowd. The older Margaret’s stake was out farther in the water, in the hopes that the younger Margaret would watch the older die, terrifying her into compliance with the oaths that the King required. Yet both women demonstrated unshakeable steadfastness. When the younger Margaret was asked what she thought of the older Margaret struggling with death she answered, “what do I see but Christ (in one of his Members) wrestling there. Think you that we are the Sufferers? No, it is Christ in us, for he sends none a Warfare upon their own Charges.” When the younger Margaret was at the Stake she sang Psalm 25 as the water was approaching her and prayed. Standing at the place where this took place, I was completely convicted. If that were me, I would be doing anything I could do to save myself (especially if all I have to do was sign a “stupid piece of paper”). If we are being honest with ourselves, isn’t that just our human nature? So to me, this story is such a demonstration of God at work in these women. We are so sinful, and yet by the grace and mercy of God He gives us the faith to stand strong in Him. Are you ready to stand firm in what you believe? Do you rely on your own strength or do you rely on the gift of faith, given to us by Jesus Christ? It is hard to believe that we have already been in Scotland for three weeks now. The more I see of Scotland, the more I am in awe of the beauty here. I have also found it is an incredible place to feed the imagination. Ruined castles, plots and conspiracies, evil villains, secret passages behind wall panels, endless dark staircases, knights in shining armor, and princesses of a bygone age all sound like things from fairy tales or mystery novels. Yet in Scotland these things are no fantasy. You can no longer see the knights, kings, and queens who once lived in Linlithgow Palace or go through secret passages which once led from a stately house to a castle a mile away, yet they were at one time a reality here in Scotland. The history and the stories of Scotland are absolutely fascinating. It has been wonderful, not only to learn about these things in books but to see the places where so many notable people walked in past ages. We have learned a great deal about the history of the Reformation and the Covenanters here in Scotland over the past few weeks as we were gearing up for our Reformation Tour this coming week. I have again been so impressed by the courage and faith of the men and women who were not afraid to give their lives for Christ. It is also a sad testimony to how people can be turned against their own countrymen and commit terrible atrocities. In our travels this week we saw the House of the Binns, which belonged to the notorious persecutor of the Covenanters, General Thomas Dalziel. If captured, Covenanters could be taken to that house and a number were tortured and died there. Dalziel was a hated man for his cruelty not only to Covenanters but in other quarters as well. We were told how Dalziel had a secret passageway accessed from behind the paneling of his house, which ran underground to the nearest castle, probably a mile away. This week we also enjoyed seeing Linlithgow Palace which is beautiful even though in ruins. Walking through room after room, it was easy to imagine its grandeur at one time. We climbed to the top of the highest tower of the palace and could see that at one time the tower went even higher with a spiral staircase around the outside, but now that staircase leads into oblivion. It made me think of Robert Lewis Stevenson’s Kidnapped where the main character David is sent by his evil uncle to retrieve things in the dark only to find the winding staircase leads him right off the edge. Had he not been careful he would have fallen to a certain death. I have encountered many things this past week that have either brought my mind to stories I know, or which would certainly make for excellent story material. Scotland is truly an amazing place.